When Aishwarya Rai Bachchan joined Instagram, fans of the beauty across the globe were extremely happy. It was since a long time that they were waiting to see the actress join the social media and share some intriguing pictures. Aishwarya might not be super active on the picture and video sharing site, but when she decides to post something, it has always grabbed the audiences’ attention. 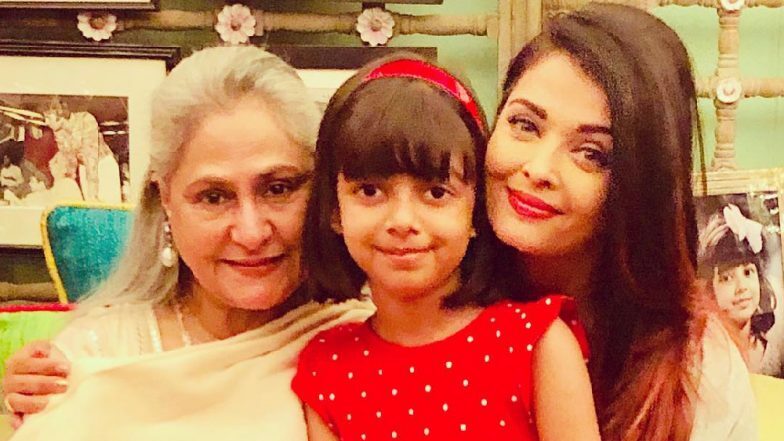 This time Aishwarya shared a picture in which her mother-in-law Jaya Bachchan and cutie pie Aaradhya are also seen. This picture is precious as it brings together the strength of Bachchan parivaar in one frame. Happy Birthday Jaya Bachchan: 5 Best Films Of The Yesteryear Actress That are a Must-Watch. On April 9, veteran actress Jaya Bachchan turned a year older. She celebrated her 71st birthday and we also saw the pictures of the family coming together to celebrate the occasion. While wishing on social media is a common norm, the way one wishes his or her near and dear ones grabs eyeballs. While Ash decided to wish with this adorable photograph, Abhishek Bachchan posted a throwback picture of his mommy dearest. At the India Today Conclave 2018 AB had stated “My relationship with Maa is that of a son and mother. Growing up, I didn't like watching her films. It was only when I started training as an actor I saw her films and they were brilliant. It is fantastic to see her perform with so much ease.” Vikram Prabhu, Karthi, Aishwarya Rai Bachchan, Keerthy Suresh Come Together for Mani Ratnam’s Ponniyin Selvan? Meanwhile, the rumour is Aishwarya Rai Bachchan has signed a film with ace filmmaker Mani Ratnam. However, an official announcement is awaited. So do let us know about your thoughts on this adorable picture shared by Ash on Instagram. Stay tuned for further updates.